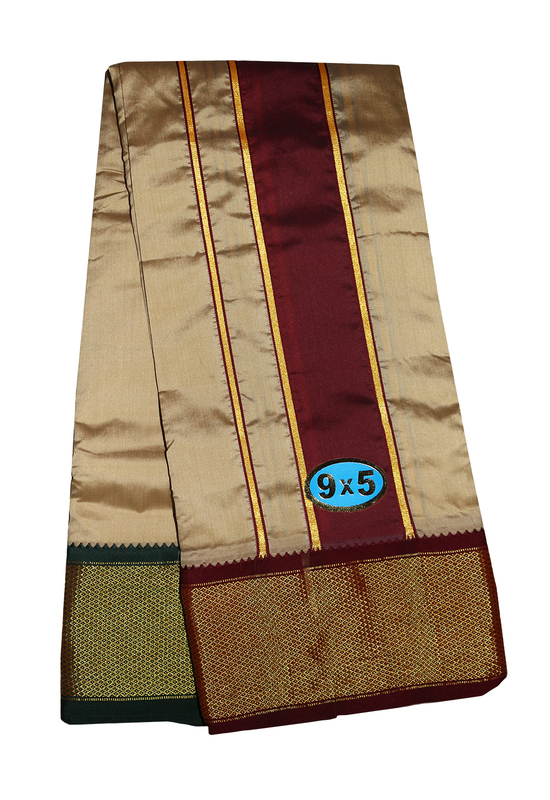 Prakasam Cotton is the one of the leading online dhoti sale brand in India. 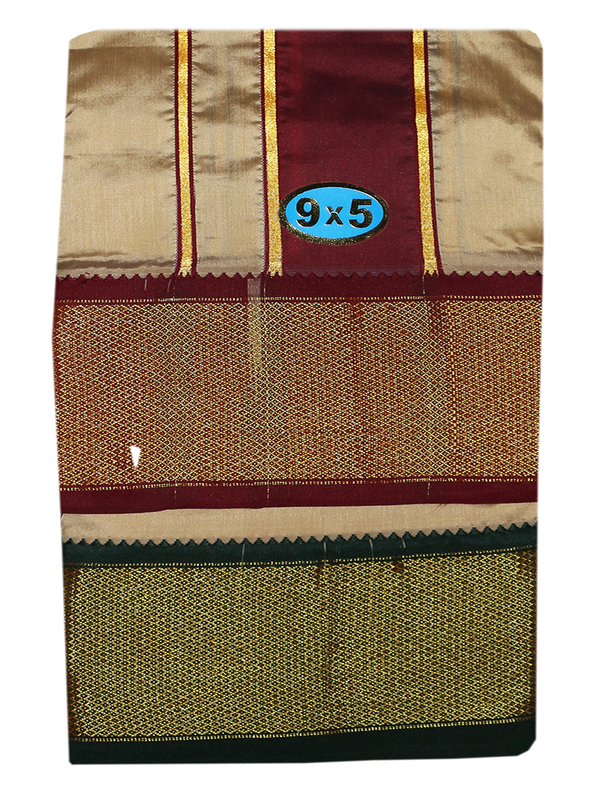 In this product is the Panjakejam dhoti towel set. Dhoti size 1.30 X4.00 meter and the towel size 1.30 x 2.20 meter attached together. Its a perfect wear for temple and casual wear. The border size is 7 inch and its looking very good. For the following Conditions must follow in this dhoties. 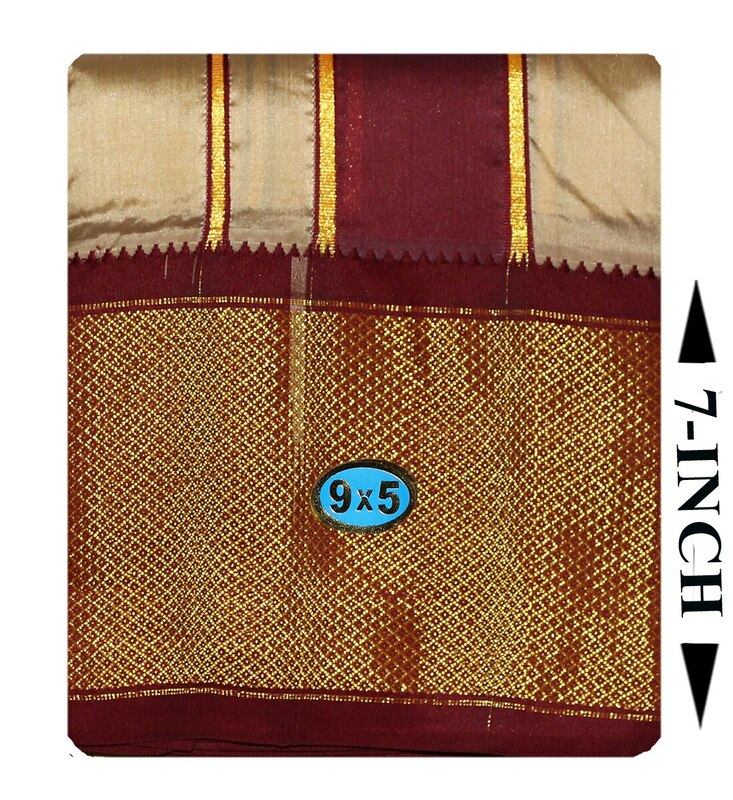 Maintaining Silk,art silk & poly To retain the glory of This, a great deal of meticulousness is required at every stage. With proper care, silk can be well-maintained for years together. Washing 1. Do not use soap for the first three washes. Gently rinse in plain cold water. 2.For the subsequent washes, use a mild detergent. 3.Avoid washing the dhotie with inferior quality material or bright colours. 4.Avoid using chemicals - these may damage and reduce the lifespan of the silk. 5.Do not brush or lash the silk dhotie; it might lead to tearing the zari. 6.Avoid twisting or wringing the silk. 7.Do not bundle and keep wet for long durations. Drying 1.After washing, the dhotie must be dried immediately. 2.First, roll the dhotie in a dry towel to remove the excess moisture. 3.Then, hang it on to a padded hanger. 4.Ensure that the silk dhotie is out of direct sunlight. Dry-Cleaning 1.In dry-cleaning, fluids are used to remove stains from the fabric. 2.The fluids contain little or no water and do not penetrate the fibre as water does. 3.Dry-cleaning is the best way to care for silk, since the solvents used do not affect silk. 4.The following points must be kept in mind when taking your silk clothes to the dry-cleaner. Ironing 1.While pressing, keep the iron in medium heat only. 2.Press silk while it is still damp with a warm iron, or use a steam iron.